Tickets are available for purchase by clicking the showtime above. Tickets are $110 for PFC Members and $125 for non-members. Gosford Park: Robert Altman, one of America's most distinctive filmmakers, journeys to England for the first time to create a unique film mosaic with an outstanding ensemble cast. 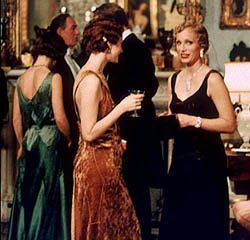 Set in the 1930's, "Gosford Park" brings a group of pretentious rich and famous together for a weekend of relaxation at a hunting resort. But when a murder occurs, each one of these interesting characters becomes a suspect. Cinema Thyme is a unique merging of film and fine culinary prix fixe menu from Ciao Thyme, designed especially for each film in the series. Guests will enjoy a light reception before the film, perfectly timed treats throughout the screening which coincide perfectly with noteworthy plot points, and when the film is over: a formal, sit down dinner in the lobby of Pickford Film Center, complete with curated wine selections and the excellent service Ciao Thyme is known for.